Home › Life Insurance › Estate Planning › Executor – What are the duties? Find the deceased person’s assets and manage them until they are distributed to inheritors. Figure out who inherits property. File the will (if any) in the local probate court. Finding and Filing the Will. Use estate funds to pay continuing expenses. Pay debts. Notice to Creditor of Death. requires a fiduciary to carefully manage trust or estate assets. Assets must be sold at proper prices and on proper terms. A fiduciary must not favor any beneficiary over another. How does an executor transfer title to a car that is being sold from the estate? How does he show that he has authority to sign the pink slip? 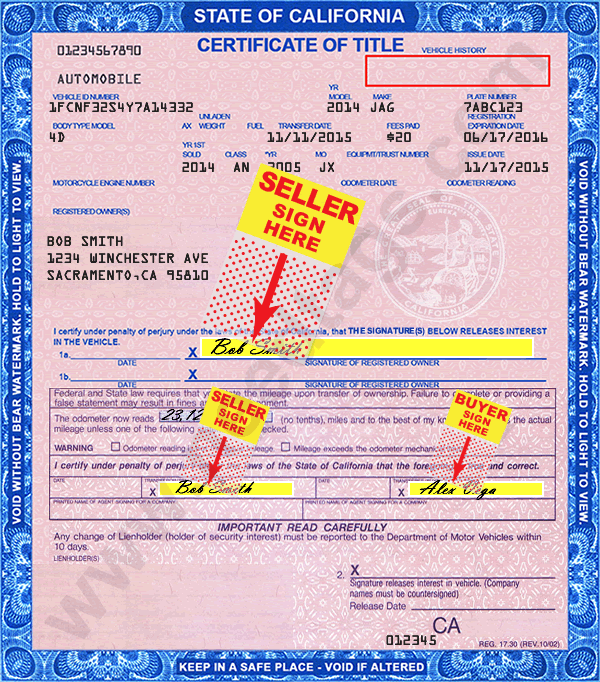 The California Certificate of Title. The heir must sign the deceased registered owner’s name and countersign on Line 1. If the heir is to be the new owner, he/she completes and signs the back of the title. completed and signed by the heir. Odometer Disclosure Statement. If you have an older title or ownership certificate without an odometer certification box, or if the vehicle was sold more than once, complete a Vehicle/Vessel Transfer Form (REG 262). This form is not available on the Internet. To obtain a form by mail, call DMV’s automated phone service 24 hours a day, 7 days a week at 1-800-777-0133. A Bill of Sale from the heir to the buyer. Additional information on transferring a vehicle without probate. This is a lesson from a coaching session (continuing legal education) this morning. There is an IRS process for imposing estate liens. They apply at the time of death and continue for ten years for whatever liability, known or unknown, as existed at that time or might come to exist at any time during that ten years. It attaches by operation of law whether any notice is given or not, and whether there is any way to know or not. The limit of the tax liability is 100% of the highest value of the estate at any time from the date of death thru the date the assets of the estate are issued. It will attach to any accounts and property of the estate first, but if that’s gone, then it attaches personally to the administrator of the estate! Here’s how it could work. Suppose grandma dies with a home and rental property worth a million dollars and it’s long since been paid off. Suppose she paid it off with a series of bold financial moves, but she didn’t file her taxes, yet, on that and she owes a million dollars in taxes. But after she dies, no one finds any paperwork to clue anyone in, so the estate is processed based upon what is known. The heirs get the property, they sell the property, and everyone is happy. Except then the IRS shows up sometime later with their numbers. Maybe they’re right. Maybe they’re wrong. The Administrator has no way to know, so there’s no way to argue. The estate was resolved years ago. The property has already been sold. The IRS tells the Administrator that they are personally liable for the back taxes, plus penalties and interest. The Administrator, having done everything as right as could possibly have been known, is now on the hook for the full value of the estate or the full value of taxes owed, whichever is lower. If the heirs had not sold the property, at least, the IRS will attach the property. If the lien totals the value of the property or higher, they can force a sale or surrender. If one heir got property and another got cash, then the one with the real estate ends up taking the brunt of the whole lien. Lots of interesting consequences for being the responsible family member! Had I learned the material from today’s class beforehand, I would recommend that people be very careful about volunteering to be an administrator of an estate. You might be stepping up to be the responsible family member, and the other family members might totally trust you, but the IRS really doesn’t care, and they really don’t care if you knew or even had any way to know. When they decide they want their money, they will go after anyone they have to for it. I could not tell you how common the scenarios are that were covered in the class today, but both my brother and I have handled estates for the family – and while our family was completely reasonable – we ran into some legal complications both times. Had any of those involved the IRS, any of the nightmare scenarios in today’s class could have been ours! Incidentally, the instructor today is a current employee of the IRS who actually handles appeals on these kinds of things. So he is speaking from his personal experience about exactly how he sees these situations play out on a routine basis. The rules are the rules to minimize how people might try to game the system, but he admits that it sometimes sweeps up good people who really did try to do everything right. Given how huge this is and the fact that chances are high I may be appointed administrator of future estates, this meant something to me.